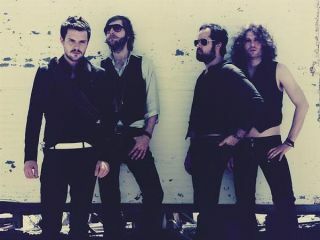 The Killers: discussing their favourite plug-ins, no doubt. The Killers' guitarist Dave Keuning has revealed that the band's hotly-anticipated third album Day & Age was demoed in Apple's Logic. When MusicRadar asked him how the new record was written, Keuning said: "It was a little different actually [to previous albums], we were a little more separate on this one". Working individually meant that the band had to have an easy way of bouncing ideas around, which is where Apple's software came in. "All of us recorded demos separately in Logic, which allowed us to email our ideas to each other and to Stuart Price, the producer," explained Keuning. "He told us his favourites and added drum loops and keyboard parts. "There was a lot of pre-production on this one so we kind of knew how things were going before we got together." For more from Dave Keuning, check out the full MusicRadar podcast interview.